Thanks to his versatility as a collaborative pianist, Robert Kulek regularly performs with some of the foremost instrumentalists of today, including Nikolaj Znaider, Arabella Steinbacher, Daniel Mueller-Schott, Augustin Hadelich and Simone Lamsma. 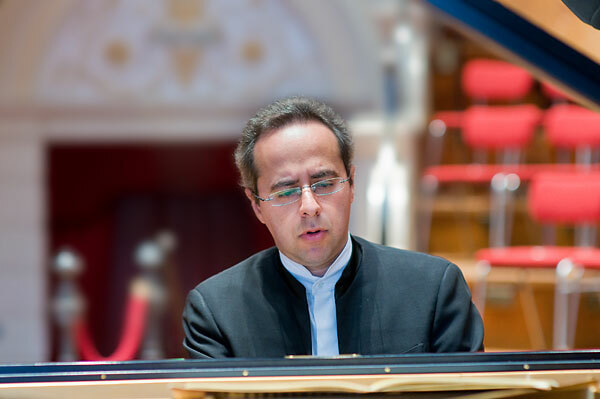 He has also worked with such distinguished musicians as Kyung-Wha Chung, Gil Shaham, Julia Fischer, Julian Rachlin, Viviane Hagner, Shmuel Ashkenazi and Alisa Weilerstein, as well as the Jerusalem, Vogler and Aviv Quartets. His repertoire ranges from Bach to Ligeti and includes over 120 works for duo, trio, quartet and quintet. Robert Kulek has received high critical acclaim for his work in Europe, North America and the Far East. His concerts have taken him to venues such as the Philharmonie in Berlin, Semperoper in Dresden, Philharmonie in Cologne, Herkulessaal in Munich, Concertgebouw in Amsterdam, Musikverein in Vienna, Mozarteum in Salzburg, Tonhalle in Zurich, Victoria Hall in Geneva, Théâtre des Champs-Elysées and Musée du Louvre in Paris, Palais des Beaux Arts in Brussels, Wigmore Hall and South Bank Centre in London, Teatro San Carlo in Naples, Teatro della Pergola in Florence, Conservatorio Verdi in Milan, Palau de la Musica in Barcelona, Filarmonica in Bilbao, Carnegie Hall and Avery Fisher Hall in New York, Herbst Theater in San Francisco, Chan Center in Vancouver, Palais des Beaux Arts and Pollack Hall in Montreal, Seoul Arts Center in South Korea, and Casals and Ohji Halls in Tokyo. His festival appearances have included Schwetzingen, Mecklenburg, Nymphenburgersommer and Rheingau in Germany; Lucerne and GAIA in Switzerland; Colmar and St. Denis in France; Storioni and Zeist in the Netherlands; Ravinia in Chicago; and the Vancouver Chamber Music Festival. Robert Kulek has always had a great passion for teaching and Since 2012 is a faculty member at the Music Conservatory in Cologne, Germany where he teaches chamber. He also gives regular Masterclasses at The Royal Irish Conservatory in Dublin and has served as a jury member of the Irish Musician of the Year in 2013 and 2014. He has recorded for the Deutsche Grammophon, EMI, Orfeo, Pentatone, Avie and Tudor labels. A French sonata programme recorded with cellist Daniel Mueller-Schott was nominated for the Edison Award and was selected as CD of the Month in both The Strad and BBC Music Magazine. A recording of sonatas by Poulenc, Fauré and Ravel with violinist Arabella Steinbacher was a Strad Selection of the Month. A recent 2011 recording of French and Russian sonatas with violinist Augustin Hadelich was April’s “Editor’s Choice” in Gramophone Magazine, and a recording of the 3 Brahms sonatas with violinist Arabella Steinbacher received 5 stars in both BBC Music Magazine and Diapason. Robert Kulek is an American of Latvian origin. He began his musical education at Mannes College of Music in New York with Elena Leonova, then studied at the Guildhall School of Music and Drama in London with Joan Havill, and subsequently went on to Yale University in New Haven, studying with Boris Berman and Claude Frank, and earning a degree in Performance. He has also worked with Richard Goode and Maria Curcio. Robert Kulek lives in the Netherlands.